Here’s a charming little 2.5D platformer starring a little blue guy with a propeller on his head named Heroki. This is created by a small team called Picomy who actually contributed to Level Design in Sonic Mania, true story! In fact, this game originated on iOS and was even published by Sega. However the Switch version had no involvement from Sega, though Sega are still credited in the credits which you can view from the main menu. So how is this game? Does it fly or does it crash and burn? Let’s find out! 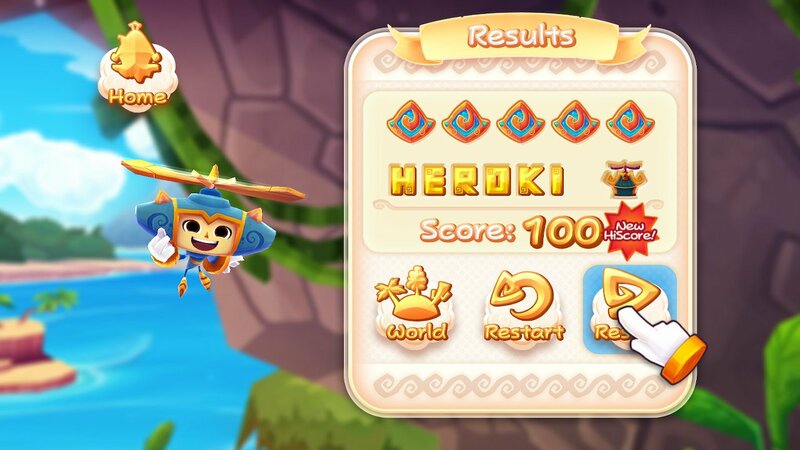 Heroki flying through the air with the greatest of chease in the second world. Heroki is at its core a collect-athon, not on the level of Donkey Kong 64 mind you (though what is?). 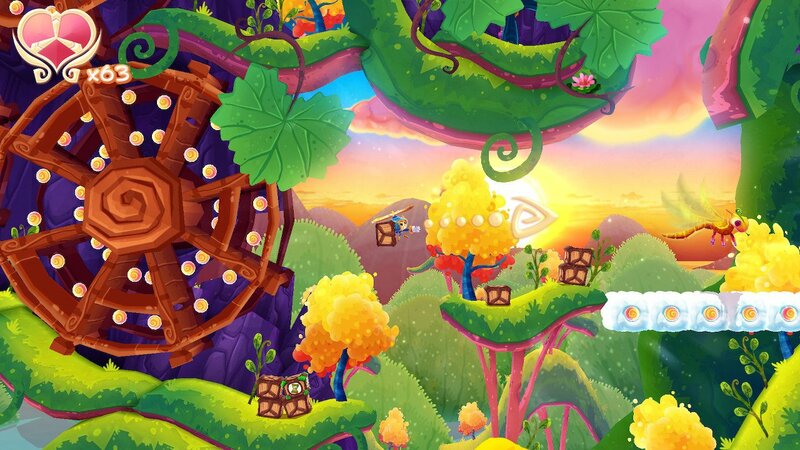 Your task is to find all collectables in a level in one go. If you miss any, you still have to collect them all later for it to count as 100%. Collectables include letters spelling out HEROKI (ala Donkey Kong Country‘s KONG letters), 5 Emerils, and one treasure chest that can contain a decoration for your house. 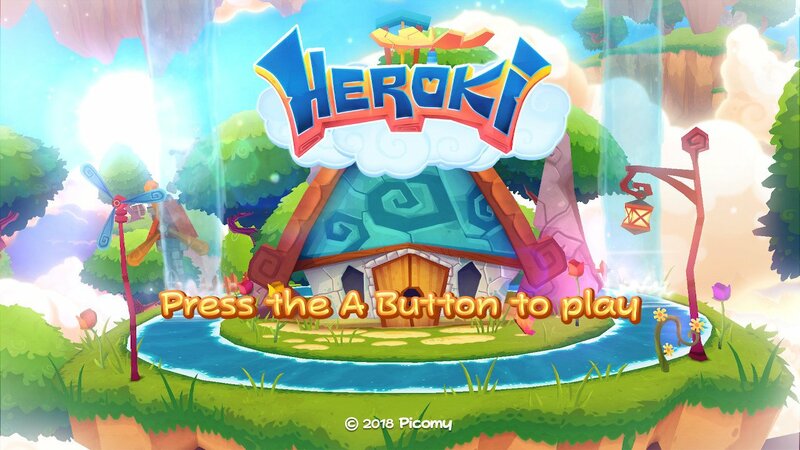 Heroki has a very simple control system; you fly with the left stick, you grab and throw items with the Y button (in a style very similar to Yoshi’s Island), you dive with the B button, and you later gain the ability to use some powers. One of which is a wind power used by pressing the X button and making a line with the left stick. Showing off the throwing mechanic. Grabbing and throwing objects is simple and certainly makes things easier since its how you defeat enemies after all. Some can be defeated by throwing boxes or rocks at them, but others require some strategy. Frogs can be beaten by throwing from far enough away so their long tongue doesn’t reach. Alternatively you can hold a rock, let the Frog eat it, and then while it’s immobilized you then grab a second item to kill it then. The former is much simpler. Blue Crocs are similar, though you do need to throw a rock in its mouth, but it instant kills them anyway. One other collectable are these swirly orbs. These are your currency. These can be found just floating in levels, as well as bursting from defeated enemies. It’s worth noting that the orbs you earn can depend on how the enemy dies. If you touch a falling enemy, it’ll burst into a full ring of orbs. If you let it hit the ground, you’ll only get a few of them. It seems that orbs somewhat “clip” into the level when they burst at ground-level. Orbs are used to buy items such as power-ups (such as cakes to restore health, as well as a shield to take an extra hit), or some bits of customization like changing the air stream that Heroki leaves when flying around. A look at the level clear screen with all collectables. 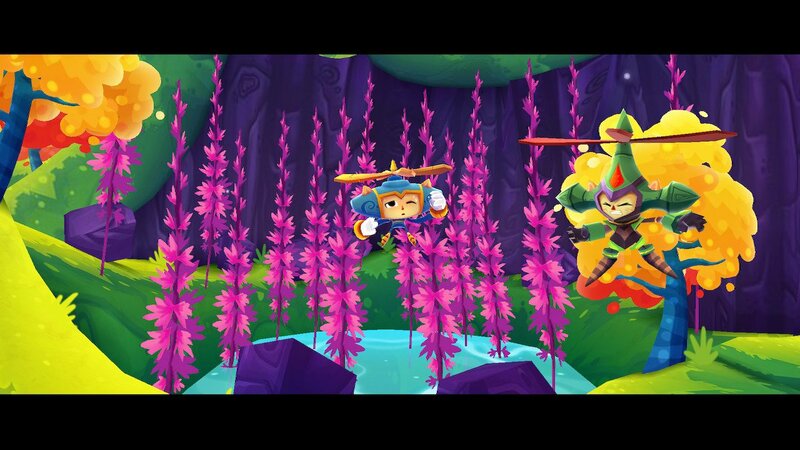 Heroki is a beautiful game, without a doubt. It seems to run at full 1080p docked at 60fps (the dev did say “full HD”), and it’s absolutely bursting with color. However its mobile roots are apparent and this is most obvious with some low-res textures here and there, but nothing too bad unless it’s very close to the camera. Audio is great also. Characters all have their own voices via grunts and just cute sounds ove all, especially Heroki himself who sounds a lot like Billy Hatcher in fact! Music is pleasant but nothing super amazing. It gets a bit repetitive since the same song plays in each level in a world so you’ll hear the same song for quite awhile, not to mention that it almost seems to loop a bit too soon. The game overall is fun but can drag, especially when you’re wandering around just trying to find every last collectable. A word of warning that some levels do have some “miss this and you have to start over” collectables. One level has a giant boulder falling above you and you have to race to the bottom. Well you better grab that Emeril at the very bottom before the boulder hits or else, nope! Another example are bells you have to hit for a string of musical notes to show up (very Mario-esc here) and they give you an Emeril if you get them all. Well if they disappear before you get them all, the bell won’t reappear. Stuff like that. 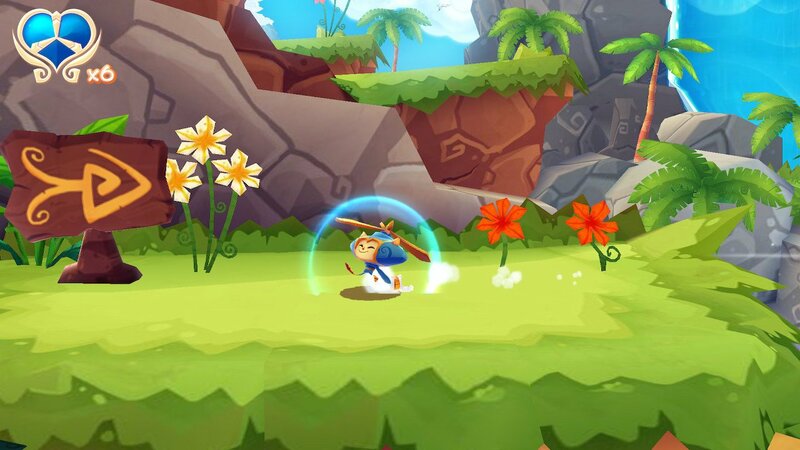 Heroki can even run on the ground. Look how happy he is! + The game is beautiful. 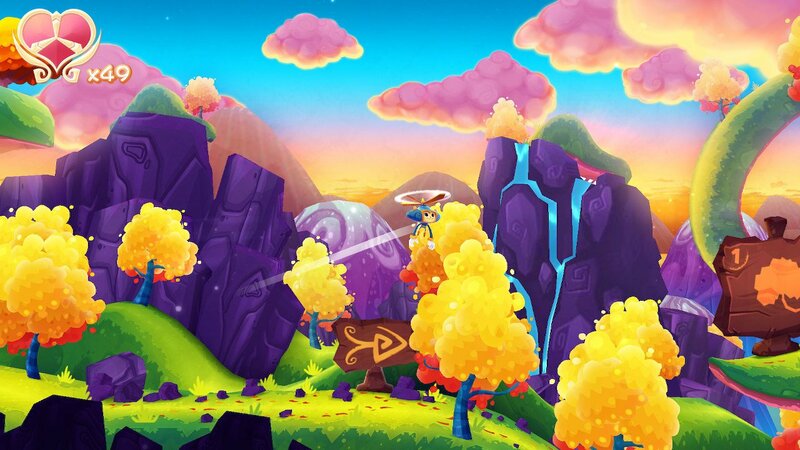 Vivid colors, great art-style. Picomy have talented artists. + The game’s very easy to control. You could say it plays like a… breeze. + Voices are adorable and all fit their characters perfectly, especially Heroki himself. + There’s no time limit so you’re free to take your time. – Textures are inconsistent. Some are clean and crisp, others look like low-res JPEG images. This is only an issue in up-close shots of certain characters and objects though, not during normal ganeplay. – Music is nice but it gets repetitive hearing the same song in each level of one world, and it almost feels like it loops to quickly. – Some “miss it and you have to start over” collectables. Not a fan of those at all. – Loading screens heavily stutter. It’d be nice if they were smoothed out.